I think you are running a bit ahead of the curve on production numbers. The 521 airframes will likely be the number flying if you include Lot 11 production run but that won't happen entirely until end Dec 2019. Until then the number is closer to around 360 plus by my count. Additionally of the 360 plus flying, 108 are not up to the 3F standard and would require various retrofit which unfortunately are unfunded and given the politics may not happen. That will be a shame..
An article from Avionics International describing data fusion with the F-35. 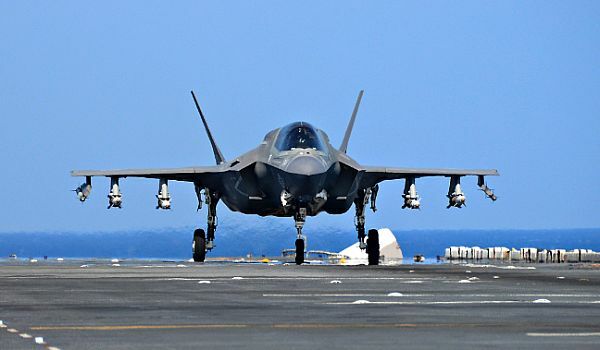 What is noteworthy is a description of the fusion protocol between an individual F-35 and a F-35 sensor formation through a tiering architecture. This is the first time I have seen such description in any public literature. What the F-35 sends out to the network is only its Tier 1 data, though, or information it has observed and measured with its own sensors. That way, each jet is only feeding the network with first-hand, reliable information so the others, and the network as a whole, can be the source of new Tier 3 data without being muddied by compounding rumor data that may or may not have been reliable. The tier approach provides some clarity in how data integrity are maintained between an individual F-35 and a formation when it comes to COP. The article talks about a "network" that generates the Tier 3 data without explaining "who" or "what" is this in reference to. The only platform within this network that has data fusion capability would be a F-35. I would speculate that a lead/designated F-35 would be responsible for it. If this is the direction it also means that there is a switch to flip the fusion battlespace presentation between Tier 1 and Tier 3.
how do they segregate into "Tiers"? plus, what would happen if wrong info went into their "Tier 1"? The sensor fusion architecture of the F-35 is based on centrally fusing the data. This means that after the respective sensors e.g. EOTS, EODAS, AN/APG-81 and AN/ASQ 239 have vacuumed the raw data, they are not processed at the sensor nodes but instead channeled to the fusion engine (core processor). The threat picture and tracking data are build based on the fusion of all available raw data. The fusion process is driven by a set of algorithms and the reason for the millions of line of codes. The outcome of the battlespace picture is the tier 1 data. If certain sensor data is corrupted by noise from electronic counter measures, the idea of fusing all raw data derived from source helps to isolate bad data from individual sensor. In a sensor formation of typically four F-35’s, each will derive its own tier 1 battlespace presentation. When the tier 1 data is then shared within the formation, this is when the tier 3 battlespace picture is made available. Once at tier 3 layer, all the F-35’s will share a common operating picture (COP) of the battlespace and if there are any link back to C2, the same COP will be available. After removing the F-35 (and also the older F-15) from consideration, Germany now has three choices. It can augment its planned 177 Eurofighter Typhoon fleet with up to 90 additional Typhoons adapted for suppression of enemy air defense and electronic warfare missions. That fleet of some 267 Typhoons would simplify servicing and training, but it could also ground the entire German fighter fleet should major structural problems appear in the aircraft. The Typhoon has had considerable readiness problems: Germany would be putting all of its fighter eggs in one basket. Germany could alternatively buy 90 Boeing F-18s (Super Hornets and Growlers), which is still under active German consideration. That decision would provide better air-to-ground and electronic-warfare capabilities for Germany than the additional Typhoons. But it would still leave Germany behind without a fifth-generation fighter as other allies move onto the future of air power. Or Germany could buy some mix of additional Typhoons and F-18s. Today, Germany flies no U.S.-built aircraft, and some observers are betting against the F-18 for that reason. So why did German political leaders make this decision? The Merkel government rules by grand coalition, with Social Democrats holding key positions in the Federal Foreign Office and the Finance Ministry. The Social Democrats tend to resist greater defense spending and have a more benign view of Russia’s intentions. Many resist Germany’s nuclear mission. And no one in the coalition wants to reward U.S. President Donald Trump. John Venable gets my Of the year award for the surest method of driving up costs and killing capability. Stoopid, Stoopid, Stoopid! From the Heritage Foundation? would Mission Data Files come into play?